LIVINGSTONE, David (1813-1873). African missionary & explorer. 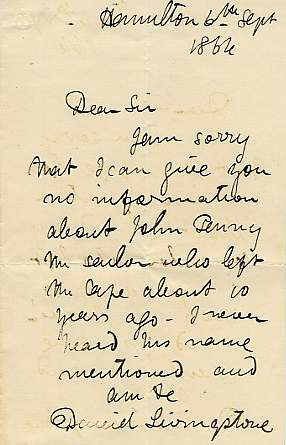 Autograph Letter Signed to Mr John Crookes, 1 page 8vo with integral blank and the original envelope (marked 'Dr L'), Hamilton, 6 September 1864. An attractive, single-page letter in fine condition with the envelope, written on Livingstone's last visit to Britain, answering a query about a sailor, presumably from an earlier expedition. The letter appears to be unknown and unpublished. No letters to Crookes are recorded by Clendennen and Cunningham, although two other letters written on this day are known. The larger image shows the envelope.